Note: In the spirit of classic Twins Chatter dualism, both John and I have posted our thoughts about yesterday's big signing. Make sure you read John's post as well, located direcly below this one (or click here). No matter what your political affiliation, this is one return that you have to support. Yesterday morning, it was announced that the Twins had indeed come to terms with 2004 AL Cy Young award winner Johan Santana on a 4-year, approximately $40 million contract. Johan will receive around $5 million this season, $9 million in 2006, $12 million in 2007 and then $13.25 million in 2008 (according to the Star Tribune). My initial reaction (which was probably shared by nearly every Twins fan, save one) was that of extreme jubilation. It truly made my day! This signing was a huge day in Twins history. Some people were criticized the Twins’ front office because they failed to sign Corey Koskie (I don’t consider Guzman much of a loss anymore), but locking Santana up long-term more than makes up for that. This was perhaps the team’s only chance to retain Johan past 2006, because if he has another Cy Young-type season his price may very well skyrocket out of the Twins’ range. It also signifies an important commitment on the part of Carl Pohlad. I have to admit that I have been pleasantly surprised recently by the amount of money our notoriously stingy owner has allowed Terry Ryan to spend this winter in multi-year contracts. Some decisions have been questionable (i.e. $4 million for the duo of Juan Castro and Mike Redmond through 2006) but $58 million for six seasons of Santana and Brad Radke is most definitely a good deal in today’s market. Still, 40 million dollars is an awful lot of money. There is no doubt that the Red Sox or Yankees would have happily doled out $15+ million a season for the game’s best starting pitcher in 2007, but for a small market team like the Twins this is the penultimate financial commitment. If Johan performs at the level that we’ve seen the past two seasons (and there is no reason to believe he won’t) then he is worth the money, but there is still a degree of risk involved. The injury bug can strike and strike hard at any time, and such large contracts can severely handicap small market teams (see Mays, Joe). Despite the risks involved, I still firmly believe this was the right decision on the Twins’ part. I believe there was little chance the team could have retained Santana past 2006 had a deal not been done this winter. The Yankees may actually need an ace by then (as opposed to simply acquiring one for the heck of it), and a $100 million dollar contract may not have been out of the question for a rare talent like Johan. Who knows? Maybe by 2009 circumstances will have changed enough (*cough* new stadium *cough*) and the Twins will be able to keep Santana well into his prime. In my mind, here is what Monday’s resigning has a few key implications. 1.) The Twins were able to reward their best player with a fair market value contract that will allow them to keep him two years longer than they otherwise would have. 2.) Santana is finally being paid what he is worth ($1.6 million, Johan’s 2004 salary, is verifiable high robbery for a Cy Young award winner this day and age) and gets the added security and stability of a long term deal. 3.) Twins ownership shows that they are willing to spend money liberally on an irreplaceable commodity that is absolutely essential to the franchise’s continued success. 4.) Have I mentioned this one enough yet? 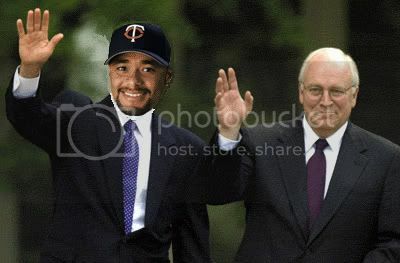 Baseball’s best pitcher will take the mound for the Twins every five days until the end of the Bush administration! Unlike many politicians, I have no doubt this is one candidate who will actually live up to all his promises. No matter what your opinion of the guy on the right, the reelection of this leftie was a major coup for fans in Twins Territory.